This tutorial is designed for beginners who want to get started with Excel VBA. 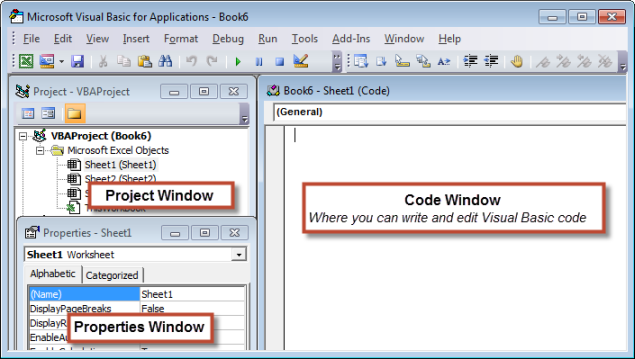 It gives you an overview of excel macros and VBA programming. A macro is used to automate a task that we perform repeatedly or on a daily basis. The macros that we built in excel are called Excel Macros. The acronym VBA stands for Visual Basic for Applications. It is an integration of the Visual Basic with Microsoft Office applications (MS Excel, MS PowerPoint, MS Access, MS Word and MS Outlook). 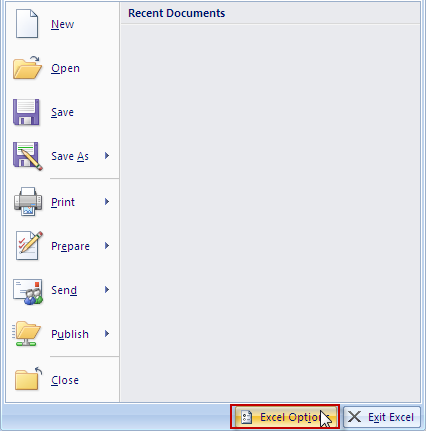 By running VBA within the Microsoft Office applications, you can automate repetitive tasks. 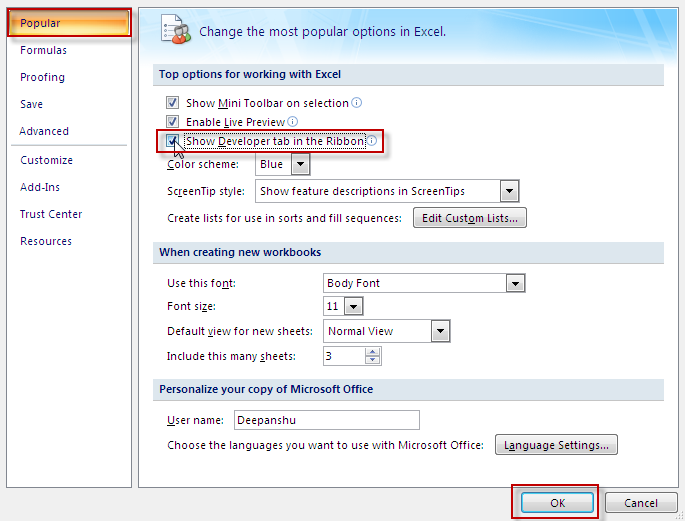 Open Excel Options from the main menu, go to Popular and check Show Developer tab in the Ribbon and click OK.
Modules - It stores macros and user defined functions that you create. The Properties Window allows you to modify properties of object, form and module. 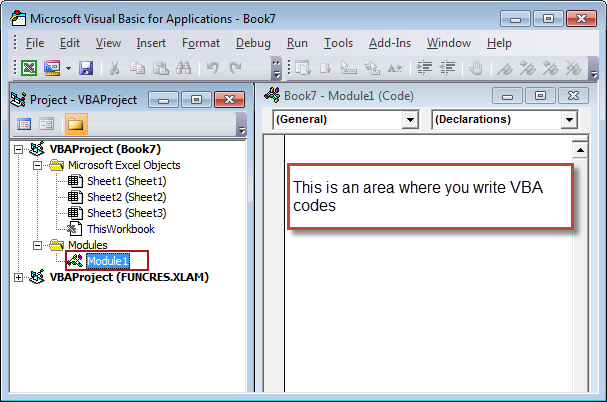 It is the area where you write and edit visual basic code. 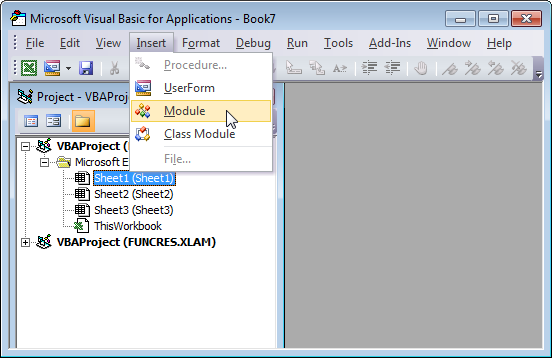 Module is an area where we write VBA code. Rule : All Sub procedures must begin with the word Sub followed by a Macro Name and a pair of empty parenthesis () and end with End Sub. To create a sub procedure, start with the Sub keyword. It is a macro name. You can give your macro any name you want. To end a sub procedure, use the End Sub keyword. 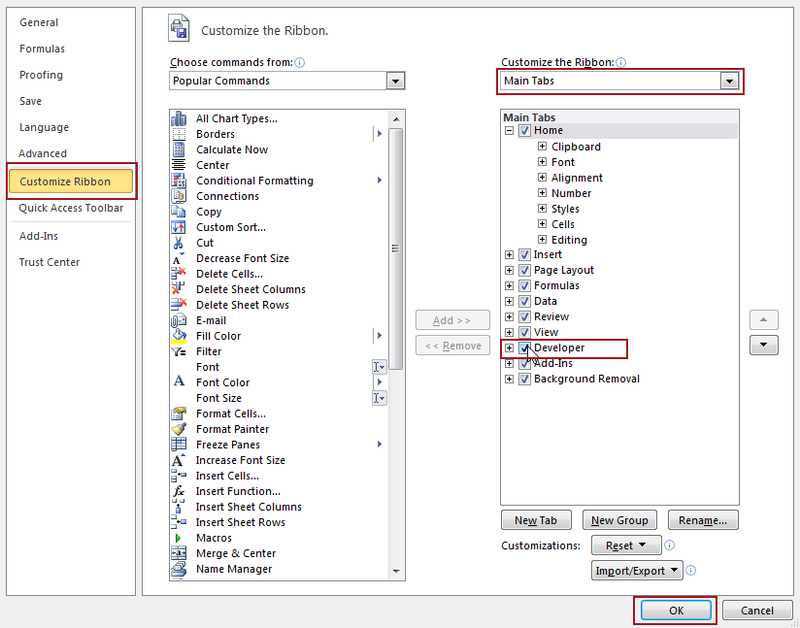 In a standard VBA code, we need to declare a variable with its data type. 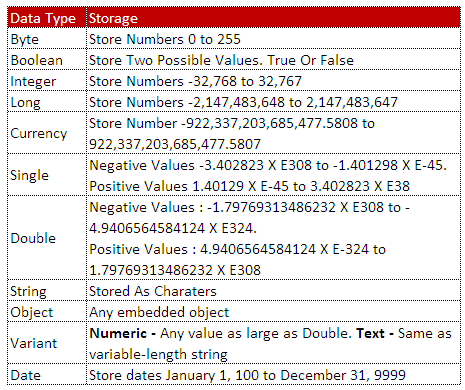 The following is a list of different data types and their storage information. Dim is used to declare a variable name. If a statement is too long to fit on a line, it can be continued with _ ( space then an Underscore). 13 Responses to "Lesson 1 : Getting Started with Excel VBA"
Amazing content if you wish to start from the scratch!! Has been really helpful..great effort!! Deepanshu Bhalla, I absolutely love your website. I needed to write a macro at work today and wanted to find some basic information online to get started. I visited your website and found exactly what I was looking for and explained so well. Thank you for your lovely words and appreciation! Thank you for providing best content. I'm learning it now. Can you please send me a soft copy to my email address? How does someone test their understanding of what they learn from your website without installing any softwares etc?